I brought the clubs with me on a visit to see our daughter in northern Vermont this past holiday weekend and was able to play 18 at the Champlain Country Club in Swanton, whose logo features a bright red-orange maple leaf (the course is just 15 minutes from the Canadian border). Champlain, designed by someone named Duer Irving Sewall in 1915, is a classic layout, and the club has the feel of a family run enterprise, which it is, and with a friendly and loyal group of members. On a crisp and breezy summer afternoon, which is to say about 70 degrees and alternately sunny and cloudy, I was stuck as a single behind a foursome and waited before every shot on the front nine; that was okay because I was taking pictures and trying to solve some chipping and putting issues. However, when the foursome stopped for lunch in the popular dining room at Champlain, I saw my chance to speed things up a bit and scooted to the 10th tee. I made it around the back nine in less than 90 minutes, without rushing, and the entire round clocked in at just 3 hours and 15 minutes. 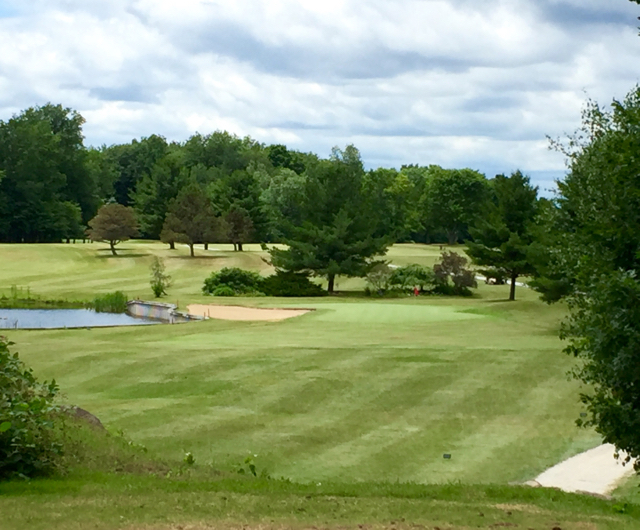 The greens are small, and fast, at Champlain Country Club (#1 green pictured). Although there were a few brown and bare spots near greens and in some of the fairways, the putting surfaces were nearly perfect and as fast as any publicly accessible greens I have played in recent memory. Clearly, the membership exerts influence on course conditions, and those non-members who pay the fairly modest green fees -- $40 on weekdays -- are beneficiaries. There are no initiation fees, and an annual membership for a single golfer is just $1,022; of course, the season that far north is short (April to October, in a good year), but if a retiree can get out on the course three times a week, the greens fee per round works out to about $13. The par 3s at Champlain offer the best opportunities to pick up strokes. 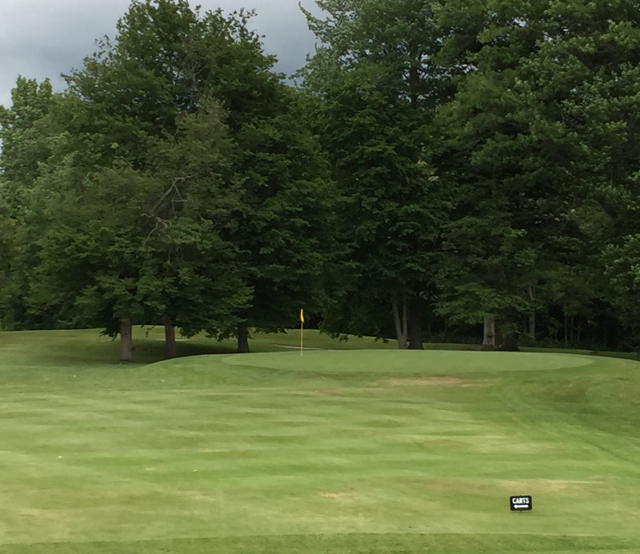 Vermont, especially in the Burlington area, is an underappreciated golf vacation destination. If you love consistently good food (heavy on the farm to table), a beautiful lake (Champlain), mountain views, and an almost endless variety of local craft beers, you won’t be disappointed. If you have a golf pro willing to intercede with a call to Vermont National Golf Club in Burlington or Country Club of Vermont a half-hour away in Waterbury, do it, although there are many interesting public course options in an hour radius of Waterbury, a small town with a selection of restaurants the equal of much larger cities, including Prohibition Pig, Arvads and Blue Stone Pizza. (I’ve eaten in all of them and can recommend.) Just across the interstate and located on a fast rushing stream, Hen of the Wood is arguably the best restaurant in the entire state. (The New York Times once said so.) Stay at nearby Stowe Village –- a couple of nice courses there too –- and if you must, take the tour of the Ben and Jerry’s ice cream factory. (Just make sure they are actually making ice cream as the tour is boring when the pints aren’t moving along the conveyor belts.) At least you get to sample the flavor of the day at the end of the tour. Most of all, if you like beer, all the local restaurants serve Vermont craft beers on tap and in bottles, more different brands and types than you could drink in a year; don’t be afraid to order the weird sounding ones like Folk Metal or Heady Topper. And when you fall in love with one, head for Waterbury’s Craft Beer Store where you just may become tipsy while contemplating the mind-numbing selection of beers on the shelves. The last two weeks have put Coastal Carolina University in Conway, SC, on the map for big time sports. Conway is the last town you pass from the west as you enter the much better known Myrtle Beach. In just one week in mid June, the school’s most famous graduate, Dustin Johnson, won the U.S. Open championship and then, a week later, the school’s baseball team earned the College World Series title in Omaha, beating the favored and more highly resourced University of Arizona Wildcats. Then, yesterday, Johnson, who has notoriously finished tournaments the way hares finish road races, closed with a flourish at Firestone Country Club near Akron, OH, to run down the favored and generally steadier Aussie Jason Day. Include this reporter among those who have never been big fans of Johnson. Having an enigmatic personality like Tiger Woods would be an improvement for the dry and diffident Johnson whose tragic pratfalls late in major tournaments would be legendary in the world of golf if not for a man named van de Velde. There has always been a sense, as well, that the 30-year old had not grown beyond his college days. Hard partying and competitive golf are undeniably incompatible, and Johnson, unlike a lost soul like Johnny Manziel, chose his sport after a stint in rehab earlier this year. The sober reality of being a new dad seems to have shaken the boy out of both Johnson's personality and his golf game. He has sealed the deal in the last two tournaments he has played as emphatically as Tiger at his best. And his post-game comments have been more assertive and confident, without a trace of smugness. Good for him, his family and for golf. 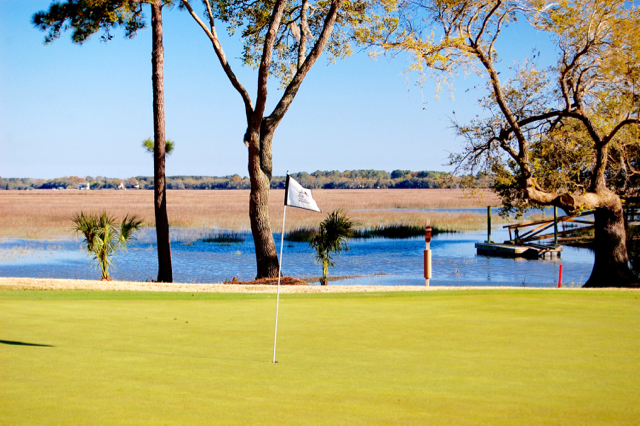 If you can stand the heat, this is a great time of year to play golf in Myrtle Beach. Summer is actually the off-peak season for golf on the Grand Strand, and prices are at their lowest of the year. Almost next door to Coastal Carolina University are three excellent layouts of varying degrees of difficulty and eye appeal at the Legends Golf complex on Highway 501, the major east/west route into Myrtle Beach and home to the huge Tanger Outlet Mall. The Heathland course, designed by the celebrated “classic” architect Tom Doak in the manner of British Isles course, features deep greenside bunkers and sweeping, unobstructed views across the entire course. P.B. Dye’s Moorland course is a bit more like its sister courses throughout the Myrtle Beach area, which is to say composed of wide expanses of sand and enough bodies of water to get your attention (and, if you are not on your game, your golf balls.) The Parkland was designed by local architect and golf course developer Larry Young and features aggressive bunkering and tricky green complexes that inspire creative shot-making. With any luck, you will catch the late-afternoon bagpiping between the clubhouse and practice range at The Legends. Those who come to The Legends hungry for more than good golf and thirsty for more than a Gatorade will be impressed that the Legends offers breakfast, lunch and two beers (or fountain drinks) to go along with the golf. Although by the time your round is done, you may feel transported to the British Isles, try to extend lunch to 4 pm when a bagpiper strolls out near the practice range and does his number. For more information on The Legends or for ideas about which of the many Myrtle Beach area golf communities might suit you best, please contact us and we will respond within 24 hours. London bridges aren’t exactly falling down, at least not yet, but London real estate prices are. Previously buoyed by an influx of wealthy foreigners, especially Russian and Arab, London has for some years been the most over-priced city in the world. The Brexit vote changed that overnight, as those wealthy foreigners are already starting to put their properties up for sale. Florida real estate agencies could be the beneficiaries. I think other Florida cities like Naples, Sarasota, Fort Myers and the Gold Coast on the eastern side of the state could do very well also as well-to-do British citizens look to escape the plummeting real estate market in London and other higher priced areas of the UK. The British have long had an affinity for vacations in Florida, and many have purchased second homes there. Non-stop flights from London to Miami, Orlando and Tampa are a few hours longer than flights to Portugal, Spain and other sun-drenched havens in Europe, but receptions for British citizens in some Euro countries in the wake of the vote could be tepid at best and vacation-ruining at worst. Florida and, potentially, other parts of the U.S. Sun Belt, could look like safe havens in more ways than one. 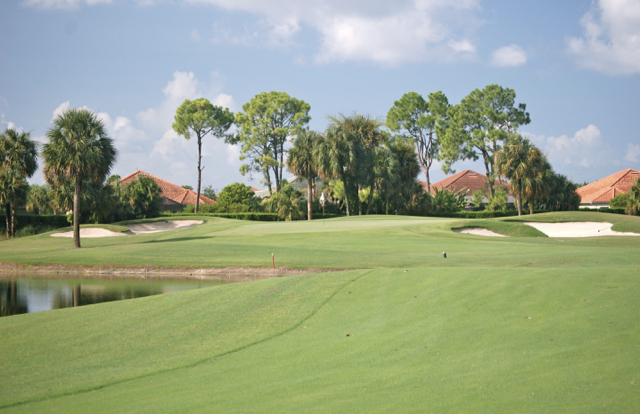 British citizens looking for a safe haven in Florida won't do much better than Laurel Oak Country Club, located near Sarasota. Europeans watching their stock portfolios and real estate values drop, and fearing worse over the coming months, don’t believe America needs to be made great again, certainly not as a place to invest. The U.S. is the world’s only true safe haven for real estate and other investments, according to global experts. If I were the chambers of commerce and major real estate agencies in Florida cities, as well as other cities in the Southeast that can be undeniably attractive to foreign real estate investment, I’d be running ads in British media read by those with real estate holdings. Yes, the drop in the value of the pound sterling has made investments in U.S. properties that much more expensive for the Brits, but the exchange rate difference is nothing compared to the impact of, say, a 50% drop in properties valued in the millions. Smart money in London may be ready to take some losses now rather than much bigger ones later. Of course, having been through a vote whose results many did not see coming, British citizens may be reluctant to jump from the fat into the fire of another chaotic and contentious campaign in the U.S. Uncertainty certainly does not inspire investor confidence. In that regard, here is an open invitation to any British citizen looking for information on the top golf communities in Florida or elsewhere in the Southeast U.S. to contact us now to lay the groundwork for a purchase decision, say, on November 9, the day after the election. That provides plenty of time to visit some Florida communities in the meantime, while lodging prices are very cheap in Florida (hot summers drive the snowbirds away) and golf communities are eager to see you. 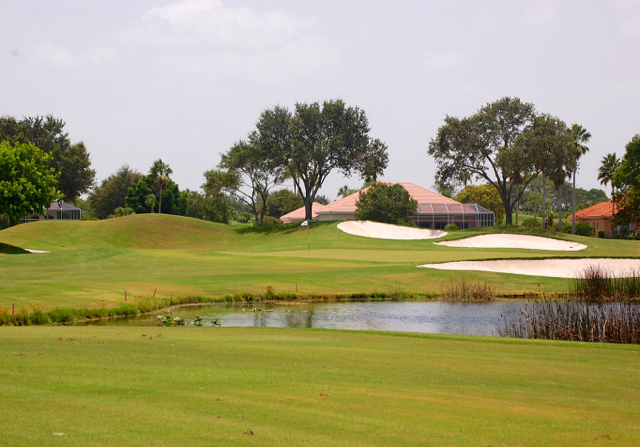 For a sample of golf communities in Florida that we can recommend, click here. 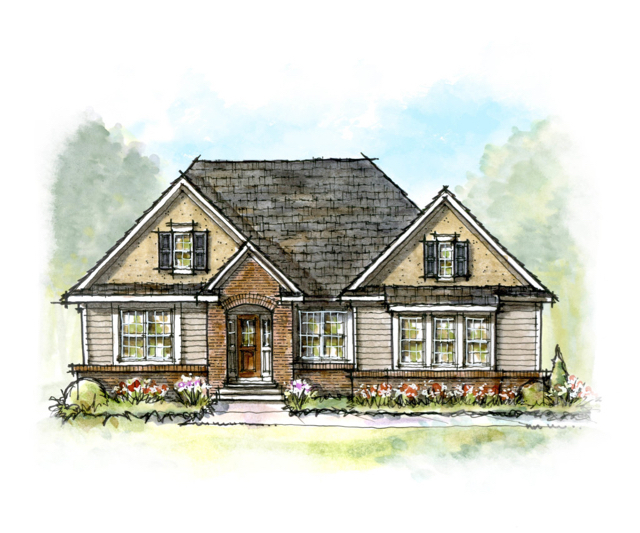 As of last week, nine of the 23 new home sites released for sale on June 10 at Aiken, SC’s Woodside Communities had been sold. The general economic and demographic environments seem to be driving the recent spurt in land sales at Woodside and throughout golf communities in general in the Southeast. Consumer confidence, especially among retiring and nearly retired baby boomers, is improving. Aside from the anxiety some might feel during a Presidential election year -– especially this Presidential election year –- baby boomers are done with deferring their retirement relocations; their primary homes have recovered much of their values since the recession, taking away the biggest excuse for waiting. And in spite of media predictions to the contrary, golf is still popular enough with 26 million people that a retirement adjacent to a fine golf course –- or in Woodside's case, a few of them –- is seen as a realistic luxury. But Woodside itself, and the location of the lots in the Summer Hill section of the community, which is bounded by a park on one side and the upcoming 12th and 13th holes of Fuzzy Zoeller’s Hollow Creek course at The Reserve Club, gets most of the credit for the strong interest. A pond, pedestrian footbridge, stone and timber pavilion and quarter-mile lighted walking path –- “walking,” boomers say time and again, is their favorite activity –- add to the appeal. The lots are priced from $55,900. Owners have no required time frame in which to build and can use home designs from Woodside’s own collection or build to their own (or their architect’s) design. Construction costs of $135 to $140 per square foot is a good rule of thumb for homes commissioned through Woodside’s building program, but if you hire your own architect and builder, the sky’s your limit. The Hancock is one of models Woodside is offering for Summer Hill. At 2,000 square feet, space enough for two or three bedrooms, it is the perfect size for a vacation home or a tidy residence for a retired couple. Costs should not exceed $300,000 to build a nicely outfitted home. The Hancock model at Woodside Communities will cost under $300,000 to build in the community's new Summer Village section. For more information about Woodside and access to a listing of properties for sale, please see our Golf Homes for Sale section. One other item of note regarding Woodside: The community is located just 22 miles from the gates of the Augusta National Golf Club. During Masters week in April, lodging in the city is notoriously short, and some Woodside homeowners rent out their houses to well-heeled tournament attendees –- and occasionally players and their families –- for enough to pay for a pretty nice golf vacation -– airfare included. It may seem counterintuitive, but the Beech Mountain Club in western North Carolina awarded free rounds of golf to 23 golfers this past Tuesday because the weather was terrific –- maybe too terrific. The surprise giveaway of free-round certificates resulted when the temperature passed 79 degrees in the typically cool environs of Beech Mountain. When Carrin handed out the certificates for free rounds, he offered the shocked golfers his “deepest apologies for the weather,” which was filled with blue skies, low humidity and refreshing light breezes. “They laughed,” says Carrin. During the program’s duration, the thermometer passed 79 degrees only three times, all in 2012, until earlier this week. Temperatures in Beech Mountain, elevation 5,506 feet and the highest incorporated town east of the Rocky Mountains, have exceeded 79 degrees only 12 times since 1992. Check out listings of homes for sale in Beech Mountain in our Golf Homes for Sale section. We noted a selection of four-bedroom houses, some with nice views, in the low to mid $200s. The golf course is a mile-high, which will add a few yards to every club in your bag. If you would like more information about the community that surrounds the golf course, or an introduction to Jim Brooks, our Realtor at Beech Mountain, please contact us. 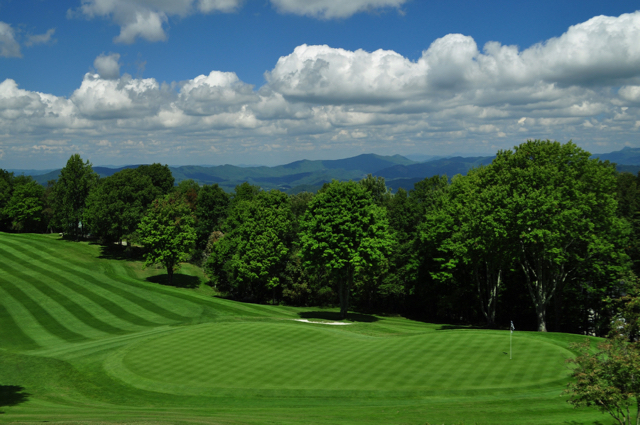 Instant Yardage: The balls fly farther when you play a mile high at Beech Mountain. Life inside the gates of a golf community may not be the best choice for every golfer. Some golfers crave variety and would rather not face the obligation of playing the same course or two courses consistently. Others don’t want to pay the fixed costs associated with private club membership. The trick for those who might live outside a golf community but near excellent golf courses is how to replicate the feeling of a private club. 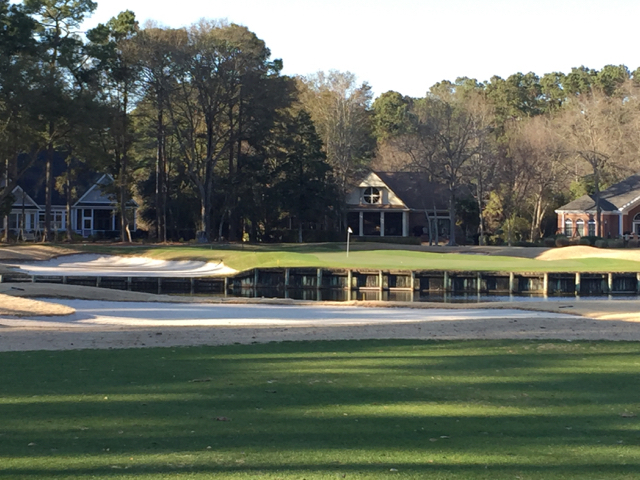 At Habersham, one of those “new urbanism” communities with a town center within walking distance of many of its homes, golfing residents have solved the problem by banding together into a “golf club,” according to Joe Moran, who runs the Habersham Golf Club. The group plays every Tuesday year round at The Legends of Parris Island, a nicely tended layout inside the gates of the U.S. Marine base near Beaufort, SC, and just 20 minutes from Habersham. “The $36 they charge is a great deal,” says Joe, who indicated that the greens superintendent at The Legends once held the same job at the private and well-respected clubs at Dataw Island. Joe Moran, left, leads the Habersham Golf Club which plays every Tuesday at The Legends on Parris Island. According to Joe, his fellow golfer's name is "Daddio." On Thursdays, the group plays another course in the area from a selection ranging from the Hilton Head/Bluffton area to the Savannah area. “We typically send out a reconnaissance group in advance to make sure that course conditions are good,” says Joe, adding that the nearby Sanctuary Island course on Cat Island can be in great condition for three months and then fall off for the next three. Joe and his wife Dee wound up in Habersham when their daughter went to college in Charleston. They hadn’t been considering a golf community for their retirement, because Joe says he didn’t want to play the same golf course four times a week. On one trip to visit their daughter in the late 1990s, they drove through Habersham –- which Joe describes as “embryonic” at the time -– and took a “leap of faith,” purchasing a lot which they built a house on in 2003. Joe says he made the right decision as both a golfer and homeowner, and points to local area golf communities like Callawassie, where some members are fighting the mandatory resident membership rule, and the top end Bluffton communities of Colleton River, Berkeley Hall and Belfair, which still feature a few $1 lots for sale by owners besieged with the mandatory membership costs. “I could not be more pleased with the way things have turned out,” he says. 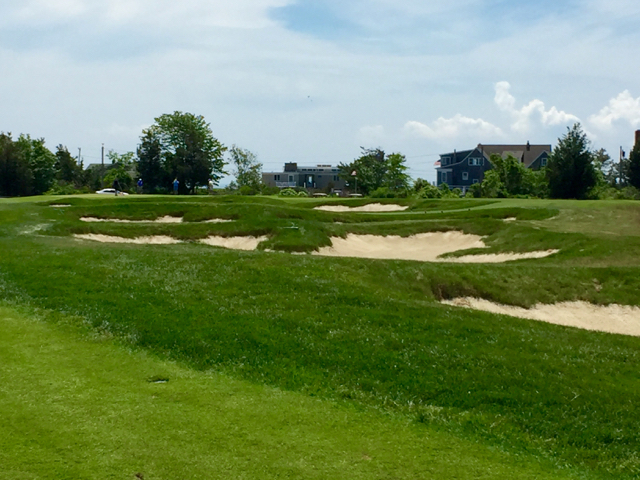 Our June edition of Home On The Course, our free newsletter, will feature all the different ways a serious golfer can play serious golf on a variety of courses, whether you live inside or outside the gates of a golf community. The issue will be emailed to subscribers on Monday, so you have time to sign-up to receive your copy and all future copies. The Junior/Senior group had played Madison a couple of years ago. The course, originally designed by the accomplished British golfer and designer Willie Park, Jr. in 1909, was looking a bit long in the tooth when we first played it, but it still had many of the classic Park touches familiar to those who have played Gullane in Scotland and Sunningdale outside London, and New Haven Country Club and Shuttle Meadow in our own state of Connecticut. Those included landing areas that appeared narrower than they actually were, some severely bunkered greens, and holes with distances that clearly were designed to accommodate wind patterns (shorter into the wind, longer with). 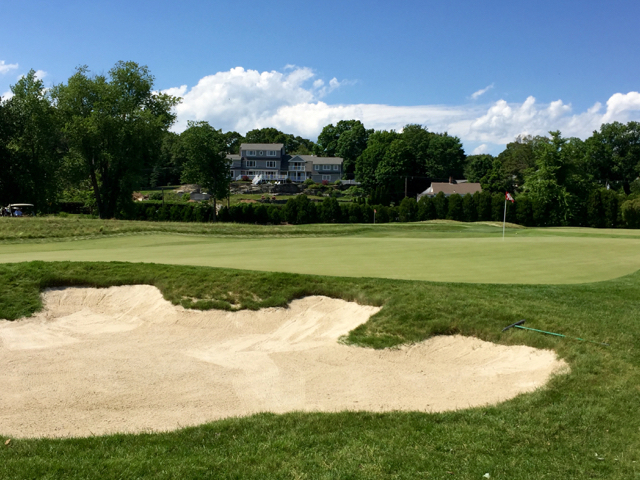 Last year, Brian Silva undertook a respectful redesign of the course, improving it by adding more contour to the bunkers, additional sloping in the fairways and a cleaner overall look, without transforming a Park course into a Silva course. The hybrid black and gold tees we played were just 6,275 yards, and the wind was only blowing modestly off the nearby Sound, but with handicaps of no higher than 12 in our group, no one broke 90. 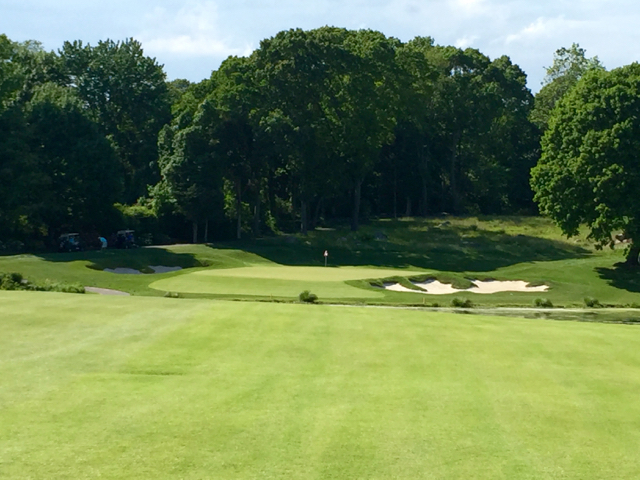 A classic golf course is one that plays harder than it looks -– think Donald Ross –- and Madison surely meets the definition. Enjoy the photos. 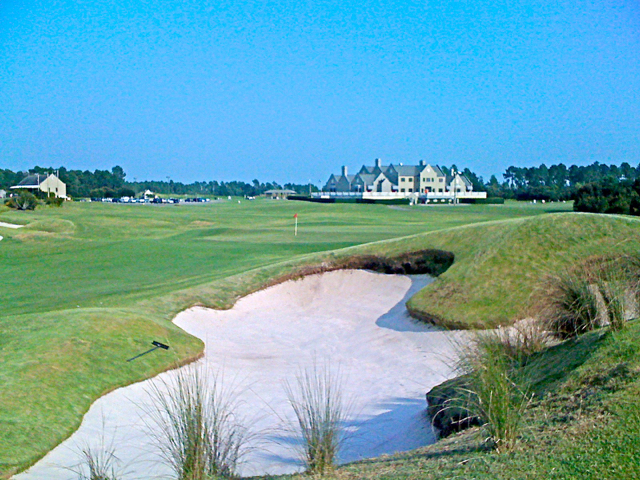 For a list of courses designed by Willie Park, Jr., click here. Tonight I start working on my wife Connie about my purchasing a “Non-Resident National Membership” for the McConnell Group of golf courses in the Carolinas and Tennessee. 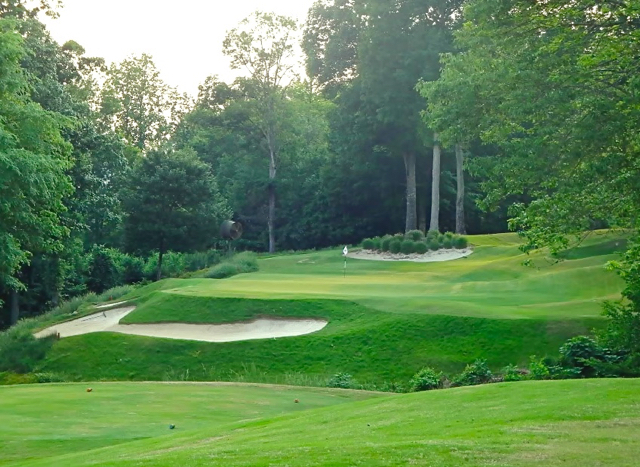 (McConnell added its first club outside the Carolinas with the recent purchase of Holston Hills in the Knoxville area.) The National Membership, which is available to anyone who lives at least 50 miles from a McConnell-owned club, provides access to the group’s dozen outstanding private courses. There are two levels of National membership. If, for example, your primary residence is in one of the three states in which McConnell operates clubs but outside the 50-mile zone, then your initiation fee would be $10,000 to join and your annual dues would be $3,875, or $323 per month. But if you live most of the year in a state other than North and South Carolina and Tennessee, and can prove it with a driver’s license and state tax return, your initiation fee is just $2,500 and dues $2,500 annually. We say “just” $2,500 because the McConnell courses are all private, they are exquisitely tended, and the layouts are among the best in the South; they include designs by the likes of Donald Ross, Tom Fazio, Pete Dye and other titans of golf architecture. They are good enough to host PGA and LPGA tour events; the Ross gem at Sedgefield Country Club in Greensboro, NC, for example, is the site of the annual Wyndham Championship. Most of the McConnell courses are located in golf communities, including at Treyburn in Durham, NC, TPC Wakefield Plantation in Raleigh, and The Reserve at Litchfield just south of Myrtle Beach, SC. My wife and I own a vacation condo about 10 minutes from The Reserve, where McConnell dramatically improved the Greg Norman layout a few years ago, and I can envision playing the golf course a couple of times a week during our visits to the area. If you would like information on these and other communities adjacent to McConnell courses, or if you would like an introduction to Lauri Stephens, the McConnell vice president of membership, please contact me. During the winter, two or three customers per week ask us for help in identifying a golf community that might suit them. (They fill out our free Golf Home Questionnaire.) But like clockwork in April, when sunshine and warmer temperatures assert themselves up North and golf courses there begin to open for play, dreams of warm winter golf fade. Typically only one customer per week contacts us in the spring. We understand. 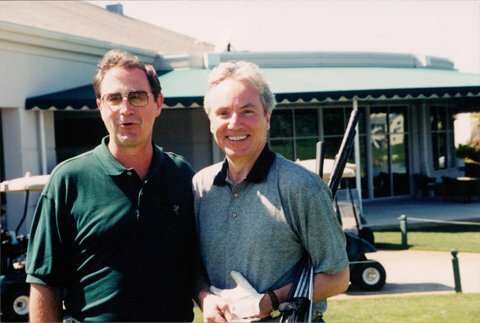 We are golfers too, and as I write this, I am looking forward to a few rounds in the coming two weeks at excellent golf courses in Connecticut. I expect those golf courses will be almost at midseason form, with evenings still cool enough that if green superintendents want to cut the putting surfaces down, we should have some slick greens to putt on. Springs and summers, of course, are generally a lot cooler in New England than those in the Carolinas, Georgia and Florida, except for the higher elevations of the Blue Ridge Mountains. Quelle Difference: Residents of Imperial Estates (shown) in Naples, FL, who stuck around for July 2015, endured high temperatures that ranged from 84 degrees to 94 during the month. Yet in Myrtle Beach during that same month, high temperatures ranged from 85 to 95. In short, there is no good reason to leave the upper regions of the nation for a vacation in the South during the summer –- unless you are considering a home where the weather is warmer in the winter. In that case, there may be no better time to go South to look for your future home than in the heat of the summer. First, you will want to understand just how hot your potential new area gets in the summer. Florida summers scare a lot of people off, but if you can’t tell the difference between an average high of 92 degrees in Florida and a high of 89 in South Carolina or Georgia -– and you can tolerate that kind of heat -- then your choices open up wide. Second, depending on the community, you might find yourself a tad lonely in the summer if that community comprises many second-home owners who head North during the hot months. Sure, the golf courses in the hot South will be easy to access, and local restaurants will have plenty of open tables; but if you are the sociable kind, you could be put off by the isolation. On the other hand, you may look on it as a reprieve. Some couples, having focused their prior 25-plus years on raising children, may look forward to a community comprising mostly retirees. But we have visited a number of such communities in the summer and found them to resemble summer camps for children; indeed, some of those communities actually organize summer camps for the grandchildren of their residents. If you plan to have visiting grandchildren of your own during summers and don’t mind a couple of months of squeals and splashing in your community’s pools, a visit in the summer will set you straight on what to expect. The summer heat in the South can play havoc with turf conditions; it is a good idea to check out how courses in your target communities weather the heat. If you are used to sleeping in and playing golf in the late morning, plan to amend your starting time in summer in the South; or make sure to stuff multiple bottles of cold water into your golf cart (you won’t be walking!). There is a reason why green fee rates drop precipitously in summer and why some private golf courses, in Florida especially, drop their restrictions and welcome public play for July and August. During an exploratory visit in the summer, test your mettle by playing during the heat of the day. You likely will do it only once. We have established excellent working relationships with dozens of top golf communities in the South and would be pleased to help arrange for you to visit on a Discovery Package that typically includes lodging, golf, temporary club membership and, often, a meal or two for deeply discounted prices. I’d also be happy to provide some complimentary advice on which golf communities in the South best suit your lifestyle. 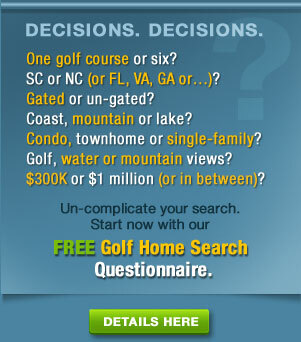 Simply fill out our free Golf Home Questionnaire and we will get back to you quickly with some initial recommendations. To date, I have visited nearly 200 golf communities and played their golf courses, a few times in temperatures bumping up against 100 degrees. In more ways than one, I know which golf communities in the South are hot. Richy Werenski won the BMW Charity Pro-Am yesterday on the Thornblade Country Club course in Greer, SC, located between Greenville and Spartanburg. The BMW is unique in that it is played over four days on three area golf courses. Each competitor plays a round at Thornblade, The Reserve at Lake Keowee and The Preserve at Verdae Greens, before those who qualify play the final 18 at Thornblade. Watching on television Werenski and his fellow competitors play the last few holes at Thornblade reminded me how much I enjoyed the Tom Fazio golf course and what a well organized and run club Thornblade is (the food in the dining room was excellent as well). Thornblade is a family-oriented club, but for those looking for a vibrant atmosphere in a well-established community -– large homes begin around $489,000 -- and economically sound area – BMW of North America headquarters is nearby in Spartanburg –- Thornblade is a great choice. 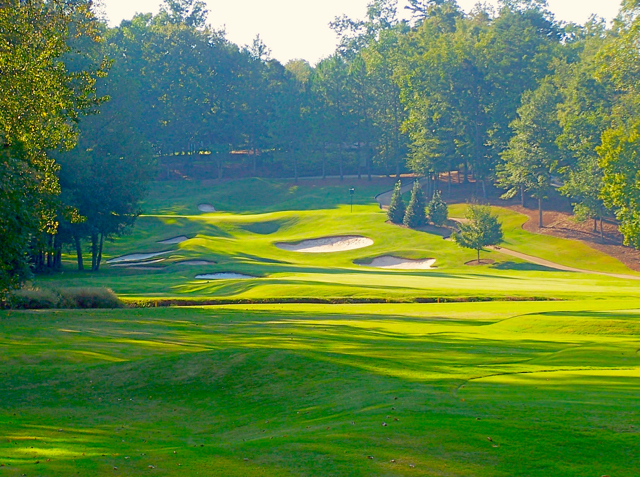 The layout at Greer, SC's Thornblade Country Club has the hallmarks of Tom Fazio's best designs. It is the site of a preliminary and the final round of the annual BMW Charity Pro-Am golf event. A golf community isn’t always the best choice for golfers, including those whose major activity is golf. On a visit to Beaufort, SC, last week, and at the invitation of developer J. C. Taylor, I stopped by for a tour of Celadon, a small but charming community characterized by live oaks arching over the roads, front porches on every home (it’s mandatory) and intermittent pocket parks on most streets. If a community can have neighborliness built in, Celadon is it. Plus the community center, featuring a fitness center, pool and activities rooms provides just about everything a golf community can, at a much lower cost. Golf memberships are available nearby at such established clubs as Dataw Island (10 minutes) and Callawassie Island (20 minutes). In short, for those looking to save some money on homeowner association dues but to live the same kind of lifestyle you would in a typical golf community, Celadon and the growing number of these “new urbanism” communities are worth a serious look. Contact me if you would like an introduction to J.C. Taylor and Celadon. Sometimes a golf community may not be the answer, even for dedicated golfers. In that case, they might choose to live in a small, but full-service development like Celadon in charming Beaufort, SC, and buy their golf membership at a club like Dataw Island, with 36 holes of Arthur Hills and Tom Fazio golf, just 10 minutes away (shown above). Duh: Florida top state for retirees, but where are SC cities? I stumbled across a website run by Smart Asset, an online information service aimed at retirees. The operators of Smart Asset looked at 2014 census data and came up with a list of those states and cities to which most people over the age of 60 are moving. By a wide margin, Florida topped the state list, followed by Arizona, South Carolina, Georgia and North Carolina. Three cities in Florida –- Cape Coral, Jacksonville and Port St. Lucie -– ranked #2, 5 and 7 on the top 10 list -– and Charlotte, NC, placed 8th. Two of our favorite areas for golf communities made the top 15 list, including St. Petersburg, FL (12), and Savannah, GA (14). Curiously, the third most popular state for retirees, South Carolina, placed no cities in the top 25; not Charleston, Myrtle Beach or Greenville, which would all be on our list. You will find the Smart Asset article here. Savannah, GA, is one of the top 15 most popular cities with people over the age of 60. Ford Plantation members spent more than $7 million on course and clubhouse improvements a few years ago. Pete Dye did the work on the course he originally designed but, except for railroad ties on one par 3, you might not recognize it as quintessentially Dye. Myrtle Beach’s golfers and local club members are nervous these days, yours truly included, because of a video out of China that recently surfaced. If you have read these pages over the last year, you know that Chinese business interests have purchased nearly one-third of all the 100-plus golf courses along the Grand Strand. My own Pawleys Plantation is part of a group of 22 clubs owned by Founders International. Its leader, Dan Liu, indicated in the video aimed at Chinese investors in Asia that recent non-golf related financial issues in China could be covered by the “sale of properties” in the U.S. Many of those properties include the Myrtle Beach area golf courses which the financial group behind Founders has owned for less than two years. Reports are that conditions at Pawleys Plantation have deteriorated since the soaking rains of last October, including the collapse of a small portion of the dike that holds the tee boxes for the par 3 13th and 17th holes; as of last week, not much repair work had been done. Anyone interested in Myrtle Beach as a destination for a primary or second home –- some excellent buys still available -– or for a golf vacation, please contact me for the latest on the China issue. China-based owners of golf courses in the Myrtle Beach area are facing financial difficulties and have hinted that their golf courses might be for sale. 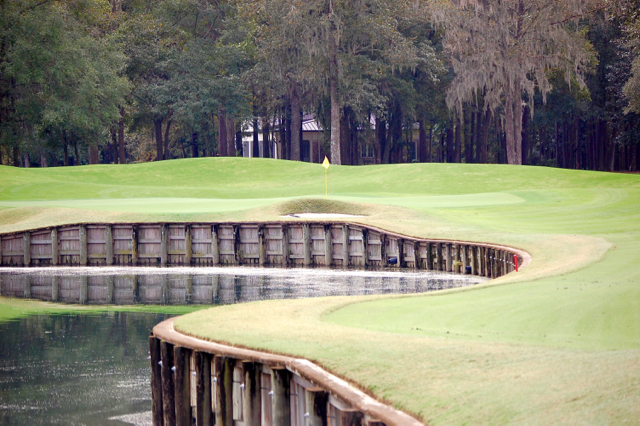 Shown is the approach to the 10th hole at Jack Nicklaus' Pawleys Plantation in Pawleys Island.